The glow of another perfect sunset slowly dims behind palm trees and mausoleums as you lean back and prepare yourself for a film screening among tombs and headstones. What could be more LA than this? Beginning as small screenings of cult classics in the iconic Hollywood Forever Cemetery over 15 years ago, Cinespia has since blossomed into a massive local phenomenon that’s become required viewing for Angelenos. 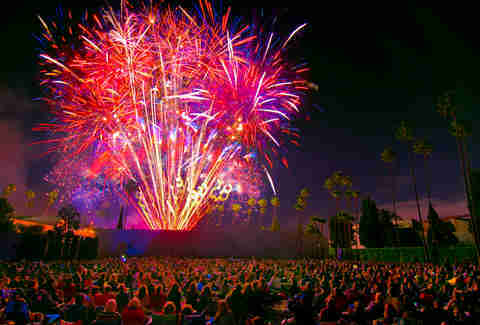 Surrounded by the gravestones of Hollywood legends, a sold-out crowd of 4,000 people gather with picnics and booze in tow to watch their favorite movies on weekend nights. With elaborate movie-themed photo booths, notable DJs and dance parties, and occasional all-night marathons, these Cinespia screenings offer a giant living room for all of LA. For the uninitiated, the Cinespia experience is totally unlike your typical night at a generic multiplex, where you just plop down in a pre-selected seat with a tub of popcorn in hushed darkness. To begin, there’s the serpentine line that gathers in front of the cemetery gates, sometimes hours before they even open. The crowd is mostly filled with 20- and 30-somethings, though it’s not uncommon to see fans both younger and older, and depending on what’s showing that night, many decked out in creative, themed costumes. Once the gates open, attendees stream in along the roadways, passing the headstones of Rudolph Valentino, Peter Lorre, and Jayne Mansfield. Maybe you’ll spot Golden Girl Estelle Getty, Toto on his way home to Kansas, or Johnny Ramone eternally shredding atop his gravestone. Past the tombstones is the large, grave-free Fairbanks lawn, where films are projected on the side of a large white mausoleum. Sure, it’s a bit creepy, but mostly it’s a cool tribute to the silver screen icons of the past. 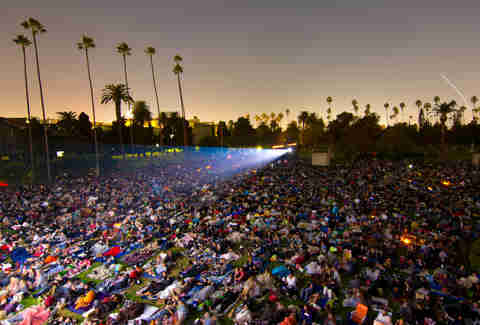 The first cemetery screening was Strangers on a Train in 2002, which drew a crowd of around 400, most of whom belonged to Cinespia founder John Wyatt’s cinema club; the name Cinespia itself is a portmanteau in Italian that roughly translates to “cinema spy.” A hat was passed to cover expenses, with a portion of the funds going to maintain the cemetery grounds, just as it is today. As word quickly spread of the screenings, the crowd grew to more than 1,000, though invitations were still sent via physical mailers and tickets were bought at the gate. In the past few years, however, every Cinespia screening has sold out online in advance with 4,000 people in attendance. As Cinespia dives into its 16th season this summer, Wyatt takes stock of the cultural impact he hopes to have made on Los Angeles. “Creating a fun atmosphere, showing undeniably good movies, booking great DJs, our photo booths and other extras have been ways that transformed the experience for moviegoers. Alia Penner, our Visual Director, creates a whole world themed to the movie with props, decoration, installations and our portrait studios.” Penners’ photo booths really are thoughtfully designed portrait studios, featuring props and furniture worthy of the movie sets to which they pay tribute, like a hotel bar for The Shining and a campsite for Moonrise Kingdom. Of course, a movie night is nothing without the people in the seats, and Cinespia has a faithful group of followers who continue to come year after year, and help spread the gospel of the experience. “They love movies, and they’re creative, fashionable, joyful people from all walks of life. Our fans' passion is electric,” says Wyatt. While spotting a celebrity in the crowd is not uncommon, the laid-back atmosphere of the screenings discourages fans from approaching. In most cases nobody seems to really care that a celebrity is sprawled out on an adjacent blanket, and the stars seem to appreciate the low-profile experience where they can enjoy the movie just as the rest of the crowd does. There’s a VIP section, yes, and it does offer a front and center viewpoint, but there are no velvet ropes or walls to be found -- mostly just some additional blankets and pillows. 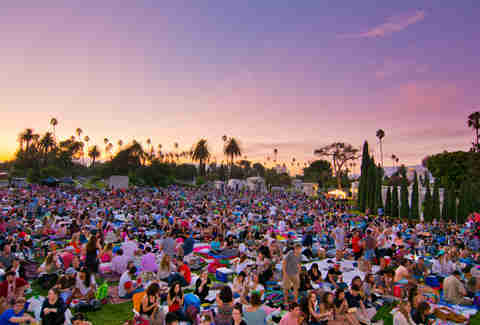 Attending a screening at the Hollywood Forever Cemetery is undoubtedly a unique experience, but Cinespia has also managed to bring that special experience to the screenings it hosts at Downtown LA’s historic movie palaces, like the Los Angeles Theatre, The Palace Theatre, and the Million Dollar Theater. The iconic venues are mostly used by Cinespia from November to early May, when it’s a little too chilly outside (by LA standards) for screenings in the cemetery. 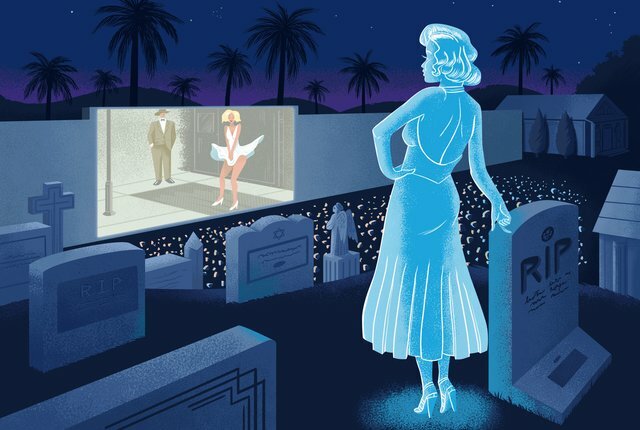 Using a cemetery to hold movie screenings is almost too perfect, given the number of think pieces proclaiming the death of movie theaters, and streaming services like Netflix and Amazon that make it easier than ever to binge watch whatever and wherever you want. Nevertheless, Cinespia continues to successfully draw audiences away from their couches -- a fact that doesn’t surprise Wyatt. "This is something streaming can never replicate. 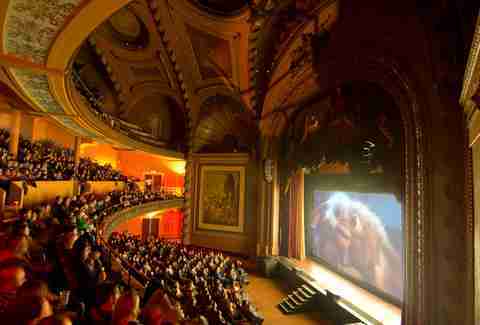 Theatres have survived the advent of television, home video, and now streaming. Nothing will ever stop people from getting together to have the shared experience of a great film on the screen.” Case in point: Cinespia teamed up with Amazon Studios as a presenting partner last year, a clear indication that the cultural impact of these screenings is being felt elsewhere in Hollywood. “As for me,” says Wyatt, “I’ll be continuing to bring people together for great films as long as I live” -- a sentiment that many of Hollywood Forever Cemetery’s permanent residents would likely have agreed with. Danny Jensen is a regular Thrillist contributor who always keeps a blanket and picnic basket at the ready for outdoor movie screenings. Follow his photo booth antics on Instagram and Twitter.